So, this edition of Essential Baby Items features an item that most people hate (or maybe just me? ), since it is associated with exercise. 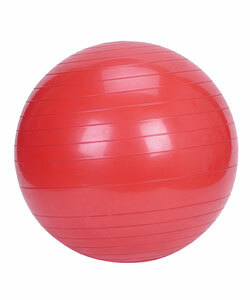 However, this item is probably the most revered thing in our household at the moment; the exercise ball. Anyway, we quickly discovered that this giant red thing that looks so tacky in our basement is actually a baby tamer. That's right folks; it soothes the screaming babe. Bounce on the ball while holding Peanut and he instantly goes quiet. Bounce long enough, and he might just fall asleep. Most often we just bounce him to the point where he sits and gremlins. (That's right. I used gremlin as a verb. I had heard all these wonder stories about swings and bouncy chairs. Sure, he likes them well enough, but if he's in a mood, there is no way he will tolerate those things. Putting him in one when he is upset just makes him scream more. The exercise ball has magic powers. It's like a forcefield of calmness surrounds it. In the beginning, only Hubby could use the magic ball, due to my c-section recovery. Now we both can, but Hubby is the pro. He even forgets sometimes and instead of sitting on the couch after the baby has gone for a nap he sits on the ball and bounces. And then I laugh. Poor Hubby. The ball is so powerful, that it is only matched by one other strategy, which is the walk/bounce/sway combo accompanied by Mommy or Daddy singing Bob Marley's "3 Little Birds" in an endless loop. That one works every time. This Essential Baby Item is a cheap one, and a sanity-saver. I think I paid about $12 for it. If you are still pregnant, then it's a great investment for coping with labour AND for baby-bouncing afterwards. And who knows, maybe one day I will also put in that pesky DVD it comes with and use it for it's intended purpose to shed some baby weight...pfffffft. Right. We also used our ball to bounce Mallory as an infant. Now she still loves to be bounced around (though it's much more playful) and she also loves pushing it everywhere around the house. I'm sure all that bouncing is tightening up your abs too. Oh, the magic exercise ball. It was just about the only thing that would soothe my son when he was an infant. You likely don't want to hear this, but eventually being bounced on that ball was the only way he would accept being put to sleep. We bounced him on that thing for every nap and every night until he was a year. A YEAR! Insanity. On a good note, I have killer quads and great balance.